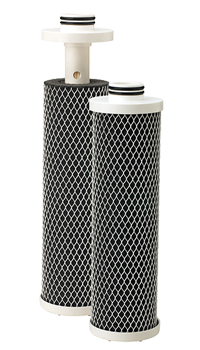 The MICROGUARD membrane filters provide reliable bacteria and protozoan cyst reduction for safer and cleaner drinking water without incorporating chemicals into the media or adding chemicals to the filtered water. The MicroGuard carbon block membrane cartridge, MG-10MCB, is uniquely designed with integral carbon block and sediment pre-filtration for the reduction of chlorine taste and odor and for providing extended life of the internal membrane element. This cartridge has 2.5 times greater filtration surface area than some anti-microbial carbon blocks and operates at a higher flow rate with lower pressure drop. This makes the MG-10MCB ideal for Point-of-Use (POU) applications. The MicroGuard cartridges do not require USEPA registration and their effectiveness is not susceptible to common substances normally found in some waters, e.g., hydrogen sulfide (H2S), natural organic matter (NOM) and total dissolved solids (TDS). The MicroGuard triple-element cartridge, MG10T, is uniquely constructed with three membrane elements integrally sealed into one common cartridge design. This unique design allows for higher flow rates and longer life while still providing bacteria and cyst reduction, and is ideal for applications up to five gallons-per-minute. The life of the MG-10T can be extended using Pentek carbon block or sediment pre-filtration options. Combined carbon block and sediment pre-filtration for extended life and chlorine taste and odor reduction. Double O-ring end cap seals for absolute sealing in Pentek Seal-Safe 3G housings.